Big games are defined by big moments. Big moments are made by the biggest names of the game. This is how basketball titles are won and how players are remembered. Equally however, there are unfortunate moments that define big games and define players. These don’t result in basketball titles, and are not how players want to be remembered. In game two of the 2015 Governor’s Cup Finals between the San Miguel Beermen and the Alaska Aces, Dondon Hontiveros had one of these game-defining moments. Less than two minutes left in the fourth quarter, and with the game up for grabs, the Aces were on the attack. Sonny Thoss and JVee Casio got into some high pick-and-roll action. Dondon Hontiveros was waiting on the left elbow just in case Casio wanted to kick out. Chris Lutz, the primary defender of Hontiveros, clogged the paint as the PNR action was happening, to prevent a Thoss or Casio penetration. Casio, reading the defense applied by Lutz, passed to Hontiveros on the wing. Hontiveros drove hard to the baseline and was eventually fouled by Lutz. Two free throws for the Cebuano Hotshot. He quickly got the ball from the referee, dribbled a couple of times and shot the free throw. It looked as if it was just any other free throw from Hontiveros. It even felt like it was any other free throw from from him. Everyone was just waiting for Hontiveros to knock down the pair and get on with the last minute of the game. The shot went long hit and the back of the rim. Clank. He wanted to redeem himself so he got the ball even quicker. One dribble and then he was already in his free throw-shooting form. He let it go. He overcompensated for the first shot that went long so his second shot was short… way short. Dondon Hontiveros just airballed a free throw in the last minute of a Finals game. On the ensuing play, SMB’s Arizona Reid, who was having a monster game, attacked the teeth of the Alaska defense off a pick-and-roll with Alex Cabagnot. The Aces were on their heels waiting for a Reid drive or a possible kick out. If Reid was going to dish the ball at the last second, the Aces expected he would pass to Lutz who was nearer. Surprisingly, Reid skipped Lutz and went straight to Marcio Lassiter on the corner. Hontiveros, the man tasked to rotate to Lutz, was caught off guard, leaving Lassiter wide open. Hontiveros was too late as Lassiter burned the Aces with another three. It was Marcio Lassiter’s big moment and another disappointing moment for Hontiveros. There’s beautiful irony into all this. Dondon, the once-upon-a-time Beerman who dedicated nearly a decade of his life to the SMB franchise. 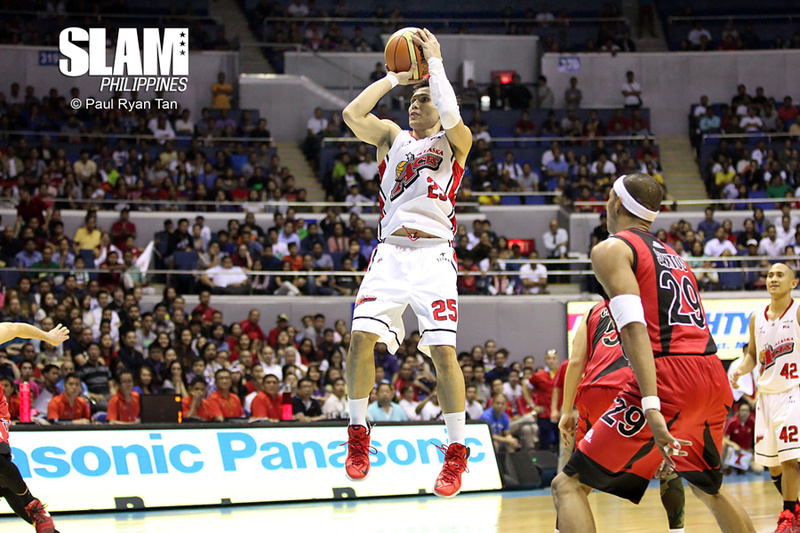 Dondon, the now Alaska Aces veteran gunslinger trying to defeat the team where he once belonged. Dondon on the charity stripe with the game hanging on the line. If he was able to knock down those free throws, or at the very least not airball the last one, and was able to rotate quicker to Marcio Lassiter, we’d possibly be talking about a whole different narrative. If we take this story further, what if Hontiveros swished home a go-ahead three for the Aces and not Lassiter for SMB? We will be taking about Dondon, the former Beerman now with the Alaska, ripping the heart out of his former team. Dondon saving his side from being down 0-2 in the finals. Dondon, one of the greatest shooters of the PBA. The aftermath of the Hontiveros debacle was expected. It was his fault for not securing the points from the charity stripe. It was his fault that he airballed that damn second free throw. It was his fault that he was late closing out on the man who was shooting at an insane clip from distance. It was clearly not the best moment for the Cebuano Hotshot. As big games such as the Finals are defined by these moments, they can sometimes unforgivingly define players as well. Because of his blunders, his recent sluggish play has been trotted out. His stats have been unimpressive this entire season. In the last three conferences, his numbers have slowly declined but nobody has taken notice until the final period of game two. From contributing almost 10 points a game in the Philippine Cup, he’s now wrestling to score, especially from the perimeter, where he previously made his living. We forget how Hontiveros was a vital cog for 10 years with the SMB franchise. We forget how he was was a two-time champion with the Beermen together with Danny Seigle and Olsen Racela. We forget how this guy was nearly overlooked in his short stint with the Air21 Express. We forget how he helped morph Alaska into a legitimate contender and eventually helped his new team win a title back in 2013. We forget how this Cebuano played for flag and country three times in his career. We forget that this marksman has connected an incredible 1,000 three-pointers in his career, dating back to his rookie season with the Tanduay Rhum Masters. As we criticize Hontiveros for his recent inefficient play and head-scratching moments, let’s also remember the moments that really define his historic career. We may see another Alaska-San Miguel Finals in the future, but there’s a possibility that we might never see Hontiveros in another one. His days are numbered as he’s heading into the twilight of his career. Playing for his new team against his former, where he spent a bulk of his career, in a championship series no less, is a gift. Similarly, playing in crucial moments with the game on the balance is a gift for any player, more so to a player like Dondon. Being relevant at this stage in his career is critical for a 38-year old player. The San Miguel Beermen might win another title in the next two or three games. There is a possibility that Coach Alex Compton and the Aces never figure out how to defend June Mar Fajardo, AZ Reid, and Marcio Lassiter. Dondon might just be a non-factor for the rest of the series. Compton might even choose not to play him. But because he’s Dondon Hontiveros, there’s that glimmer of hope that he might just do the impossible again. Because he has given us so many big moments, his fans and especially the Alaska Aces fans, are still thinking of the possibility where the Hotshot becomes the Hotshot once again, whether it be through a clutch free throw or three-pointer. He might not be able to put up a huge game where he scores 25 points, but we’re just hoping for a moment. One big moment. After all, big games are defined by big moments. We’re just waiting one from Dondon Hontiveros.